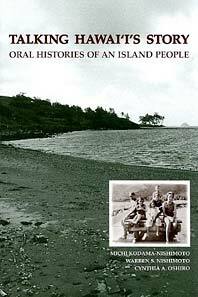 In Their Own Words: Voices of Hawaiʻi’s Past, paired readings from Bamboo Ridge Press and UH Mānoa’s Center for Oral History’s anthology Talking Hawaiʻi’s Story: Oral Histories of an Island People, will air September 7 and 14 at 6:30 p.m. on Aloha Shorts, Hawaiʻi Public Radio KIPO 89.3 FM. The first broadcast features “Hawaiʻi, Plantation of Destiny” by Virgilio Felipe, read by Troy Apostol; “Severo Dinson” read by Wayland Quintero; “Lemon Rusty Holt” read by Wil Kahele; and “The Long Swim” by Michael McPherson, read by Moses Goods. The second broadcast features “Venicia Damasco Guiala” read by Donalyn Dela Cruz; “On Hearing My Mother Call Out to Our Neighbor Over the Courtyard Fence” by Amalia Bueno, read by Kiana Rivera; “Robert Kiyoshi Hasegawa” read by Dann Seki; and “Wartime” by Juliet S. Kono, read by Kat Koshi. The readings were taped at the fifth annual Hawaiʻi Book and Music Festival on May 16, 2010. Aloha Shorts is a locally produced radio program of writings from Bamboo Ridge Press performed by Hawaiʻi’s actors. The shows are broadcast every Tuesday at 6:30 p.m. on Hawaiʻi Public Radio’s KIPO 89.3 FM. Tapings and broadcasts are supported in part by the Hawaiʻi Council for the Humanities. Past shows are archived at the Bamboo Ridge website.